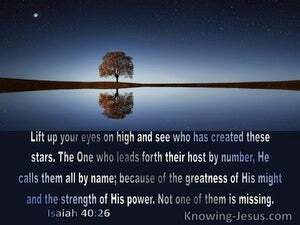 ﻿ Isaiah 40:26 Lift up your eyes on high And see who has created these stars, The One who leads forth their host by number, He calls them all by name; Because of the greatness of His might and the strength of His power, Not one of them is missing. "Lift your eyes up to heaven and see who created all these the one who leads out their vast array of stars by number, calling them all by name because of his great might and his powerful strength and not one is missing." 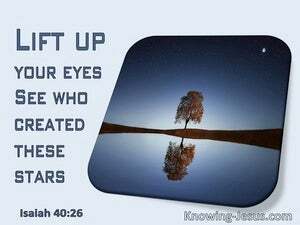 Lift up your eyes on high, and see who has created these, who brings out their host by number. He calls them all by name, by the greatness of his might. And because he is strong in power, not one is lacking. Lift up your eyes on high and see! Who has created these? He Who brings out their host by number and calls them all by name; through the greatness of His might and because He is strong in power, not one is missing or lacks anything. Let your eyes be lifted up on high, and see: who has made these? He who sends out their numbered army: who has knowledge of all their names: by whose great strength, because he is strong in power, all of them are in their places. Lift up your eyes on high, and see! Who hath created these things, bringing out their host by number? He calleth them all by name; through the greatness of his might and strength of power, not one faileth. Lift up your eyes on high and behold who has created these things; he brings out his host by number; he calls them all by their names; none shall be lacking by the greatness of his might and by the strength of his power. Lift up your eyes on high, and see who created these, bringing forth their army by number: he will call to all of them by name, from the multitude of their strength; and he is strong of power; a man was not wanting. Lift up your eyes on high, and behold who has created these things, that brings out their host by number: he calls them all by names by the greatness of his might, for he is strong in power; not one is missing. Lift your eyes up [on] high, and see! Who created these? The one who brings out their host by number. He calls all them by name. Because [he is] great of power and mighty of power, no man is missing. Lift up your eyes on high, and behold, who has created these, who brings out their host by number? He calls them all by names by the greatness of His might, for He is strong in power; not one is lacking. Lift up your eyes on high, and consider who hath made those things, which come out by so great heaps; and he can call them all by their names. For there is nothing hid unto the greatness of his power, strength, and might. Look up at the sky! Who created all these heavenly lights? He is the one who leads out their ranks; he calls them all by name. Because of his absolute power and awesome strength, not one of them is missing. Lift up your eyes on high, and see who has created these, who brings out their host by number. He calls them all by name; by the greatness of his might, and because he is strong in power, Not one is lacking. Lift on high your eyes - and see who hath created these, That bringeth forth, by number, their host, - To all of them by name, doth call, Because of the abundance of vigour and alertness of strength, not one, is missing! Lift up your eyes on high, and see who has created these, who brings out their army by number. He calls them all by name. by the greatness of his might, and because he is strong in power, Not one is lacking. 25 "To whom then will you liken Me That I would be his equal?" says the Holy One. 26 Lift up your eyes on high And see who has created these stars, The One who leads forth their host by number, He calls them all by name; Because of the greatness of His might and the strength of His power, Not one of them is missing. 27 Why do you say, O Jacob, and assert, O Israel, "My way is hidden from the LORD, And the justice due me escapes the notice of my God"? "Lift up your eyes to the sky, Then look to the earth beneath; For the sky will vanish like smoke, And the earth will wear out like a garment And its inhabitants will die in like manner; But My salvation will be forever, And My righteousness will not wane. "And beware not to lift up your eyes to heaven and see the sun and the moon and the stars, all the host of heaven, and be drawn away and worship them and serve them, those which the LORD your God has allotted to all the peoples under the whole heaven. "Of old You founded the earth, And the heavens are the work of Your hands. He counts the number of the stars; He gives names to all of them. Seek from the book of the LORD, and read: Not one of these will be missing; None will lack its mate For His mouth has commanded, And His Spirit has gathered them. Thus you shall say to them, "The gods that did not make the heavens and the earth will perish from the earth and from under the heavens."